When I think of summer, one of the first things that comes to my mind is watermelon. Trevor absolutely LOVES watermelon. For months and months, he's been begging me to buy watermelon. I prefer to buy produce locally in season whenever possible, so he's been without any until recently. When we bought our first watermelon of the season, he could hardly wait for me to cut a big wedge for him to enjoy. I got some wonderful pictures. I had so much fun putting together this layout! I usually don't pair red with green except at Christmas time, so it's a treat to work with that color combination for a different reason. The glittery Thickers added a fun touch. Did you notice that the second "e" is actually a "c" with a horizontal line added? It's one of many of my favorite tricks for dealing with a missing letter. 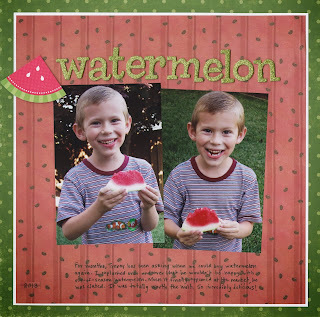 Another fun fact about my layout - I've had that pink/red watermelon paper for a REALLY long time (I'd guess 10 years). I love the way it looks backed with the white and layered on the green. Right before I adhered it, I checked the back for manufacturer information to write in my supply notebook. I was scrapping with friends, and as I dutifully wrote down the information (Debbie Mumm, Creative Imaginations, "Pink Java"), I commented on what a weird name Pink Java is for watermelon paper. Sheena took a one-second glance at my paper and said, "Those are coffee beans, not watermelon seeds." Wait... what?!?! For 10 years, I've thought I had a sheet of red watermelon paper when in reality I'd been saving a pink coffee bean paper. And I hate coffee! How funny! Before I send you off to the next stop on our Hop, how about a little prize? All you have to do is follow my blog AND leave a comment. I'll pick a random person to win a $20 gift certificate to scrapbook.com. I'll announce the winner on Tuesday. Now hop along to see more summer-themed scrapbook projects. Your next stop is Sharon, at www.thatgirlfritchey.blogspot.com. Enjoy! Loveeeeeeeeeeee this!! I love love love love those photos and loving the watermelon bit!! 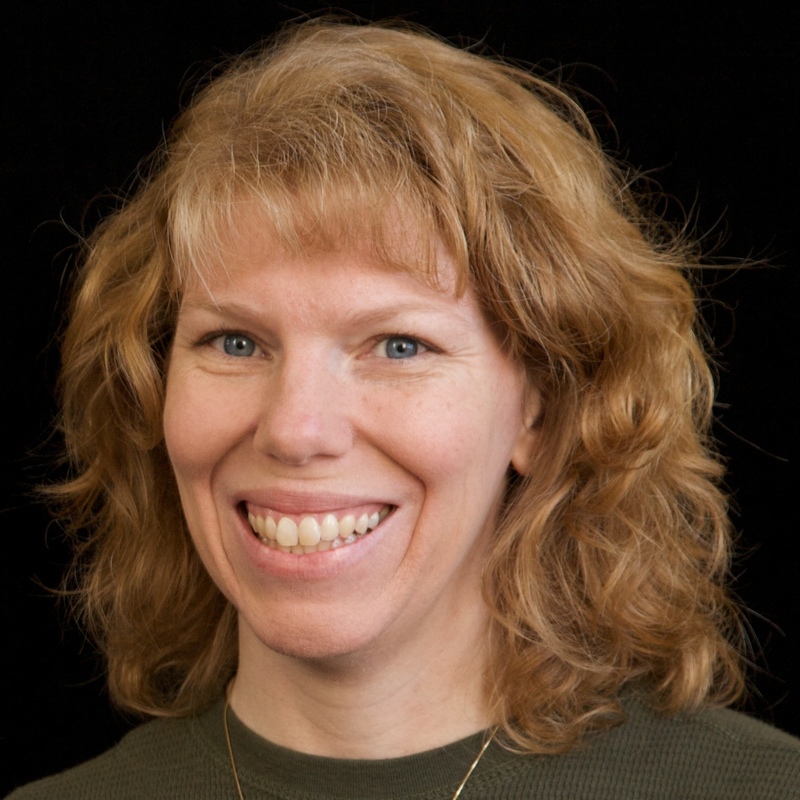 I love your simmer page, Cindy, and love the story about your coffee/watermelon paper! I love it! It looks like watermelon to me too! LOL, it looks like watermelon to me too. Great page. I like how you have the green paper beneath the Java Pink. Like a watermelon rind. Very cool. Fun page and your little guy is so cute. I forgot to say I follow your blog. I didn't even notice the second E!!! I love the layout!!! Trevor has the look of a true watermelon lover. The layout is super cute, even if they are coffee beans ;). As a dedicated coffee drinker I can honestly say I thought they were watermelon seeds! Oh yum! I love this fun layout to bits!! ROFLOL I thought they were watermelon seeds too! I didn't notice the E until you pointed it out. Cute page Cindy!! OMG so funny! But it DOES look like watermelon paper so you're good! That is so funny about the paper! I love the photos!! His smile is amazing. This is a fabulous layout! (Great job on the "e")!!! Your paper story is too funny! Looks like watermelon paper to me! Fun layout and love your "e". I can see why you thought it was watermelon paper. It looks great on this page! I love the papers you used and everything about this! Great job! So, I lol about the coffee bean paper.. not watermelon seeds... cute cute layout. Ooh thanks for the tip on missing letters. I have a ton of letter stickers that I don't use anymore because I'm out of vowels. I'll have to try this. Love your layout and cute kiddo!! Thanks for the great missing letter tip!! I'm a follower. Love the layout!